Poetry Events Reminder: June 1, Eamon Grennan; June 4, April Ossmann; July 1, Kingdom Books! Scroll down for the Eamon Grennan info; and we posted April Ossmann's event a month ago, so click here for details. We've got both Dave Zeltserman and Eliot Pattison coming this summer to talk about mysteries, so we've decided we need to balance topics by throwing a POETRY OPEN HOUSE here at Kingdom Books on Wednesday July 1, from 11 a.m. to 5 p.m. -- a great day to come to the area, because in the evening, Donald Hall is reading in St. Johnsbury, a mere five miles away from us. Our poetry room is bursting with new work as well as classics, and a lot of gorgeous poetry broadsides that we're eager to share. Thanks to poet Laura Davies Foley, we recently discovered the Upper Valley Poetry blog, "creatively chronicling the Vermont & New Hampshire Poetry Scene." Recent posts have included Laurie Scheck, Susanne Dubroff, Allen Ginsburg, and more. Check it out: http://uppervalleypoetry.blogspot.com. Pariah (Oct. 09, Serpent's Tail)--This is the second of my loosely themed "man out of prison" crime noir novels, and probably the one I'm most excited about. It's definitely the most explosive book I've written, as well as the most subversive. Bad Karma (Oct. 09, Five Star)--Sequel to Bad Thoughts, although instead of being the grim and weird mix of horror and crime that Bad Thoughts was, this one is a hardboiled PI set in Boulder, Colorado, with some quirky new age aspects to it. Killer (Jan. 10 (UK), Serpent's Tail)--The third of my "man out of prison" crime noir novels. Existential noir. 28 Minutes (July 10 (UK), Serpent's Tail)--My bank heist thriller that's been optioned to Impact Pictures and Constantin Film Development. The US publisher for this one is still being worked out. Caretaker of Lorne Field (Overlook Press)--This one's an allegorical novel, written as a mix of noir, sci-fi, and horror. A caretaker believes if he doesn't weed a field every day the world will end. Either he's insane or he knows something no one else does. Essence (Overlook Press)--Gritty crime noir with supernatural elements. The book is placed in Brooklyn and Manhattan, with the time frame for most of the book centered around the 2004 ALCS Red Sox--Yankees playoffs, with the Yankees choke job (the worst in the history of professional sports??) seen through the eyes of a Yankees fan. See what I mean? Add these to the film option that he just agreed to, and Dave Zeltserman is not only one of the hardest working authors around, but also one of the hottest. By the autumn of this year, "everyone" will be talking about his books in the US (at last!). Here at Kingdom Books, we're talking about them NOW. I'll start today with BAD THOUGHTS (Thomson Gale, 2007). The action opens inside a nightmare that Bill Shannon, a cop in Cambridge, Mass., is having -- one in which he's bring forced to pick up a knife and kill someone. That's disturbing enough. But double the horror when Shannon realizes that women are being killed in exactly this way, while he endures his dreadful dreams. They date back to the death of his mother when he was just 13 years old ... Also haunting him are blackouts, perhaps linked to his own drinking, that plague his adult life. They cut in around the same time each year, the anniversary of his mother's death. Since Shannon doesn't know what he's done during his time away from himself, and his wife and best friend fail to figure it out either, the creepy suspicion among all of them is that Shannon may be the killer. Even of his mother. It doesn't help that Shannon's therapist seems to be falling into the circle of death. And since Shannon and his fugue states are clearly getting worse, his wife Susie has about had it. Half the time she wishes he were dead; walking out of the marriage is looking attractive. She stood frozen, staring down at him. An angry, painful sob convulsed through her body. "Weren't you supposed to be all cured? Isn't that what your therapist has been telling you?" she asked, her face turning a hard white. When Shannon remained mute in response, she exploded, "Answer me! Are you even in there?" "Where else would I be? he said after a while. She opened her mouth, closed it, and fled to the bathroom, slamming the door behind her. She stood frozen in front of the mirror and then started to sob uncontrollably. Soon isolation, terror, and a sense of crumbling from the inside beset Shannon, not a great situation from which to try to save his own life and those around him. Zeltserman combines a gritty police procedural with a carefully crafted state of horror, and a sense that the sociopathic mind of a truly dangerous criminal is creeping into each scene, each character, each weighing of risk and terror. In other words -- this is one great read if you leave the lights on and check that the doors are locked. More soon on SMALL CRIMES, which really got under my skin. Meanwhile, if you'd like to read an interview with Zeltersman, here's one at Murderati -- and be sure to let us know if you're coming to his event at Kingdom Books. Seating is limited, and so are the copies of books available. Contact "my" Dave (Kanell, here at Kingdom Books) directly at dknel@charter.net or 802-751-8374. Scheduled for Monday June 1 at 8 pm at Vermont Studio Center's Lowe Lecture Hall on Main Street in Johnson, VT: poet Eamon Grennan, born in Dublin and teaching since 1974 at Vassar College. Be sure to call on that date to confirm, as the VSC often has schedule changes: 802-635-2727. We like his newest collection, THE QUICK OF IT, which appeared in Ireland in 2004 and in the United States in 2005. We left home at about 11 a.m.; we got back about 12 hours later. All this, in order to attend an author event with all of the above, plus James Benn as MC and Kate's Mystery Books as bookseller of the night, at Stellina's Restaurant in Watertown, Mass. I took notes like mad while the authors answered questions, panel style. Baseline info: Garry Disher, born in 1949, here thanks in part to a travel grant from the Australia Council for the Arts to Soho Books, to bring him to this side of the globe. Cara Black, born in 1951, is at home in San Francisco but flies to Paris for research for each of her Aimee LeDuc mysteries -- and recreates Paris in her mind when she's writing. Henry Chang, born in 1951 also, native to New York's Chinatown, three-quarters through the first draft for his third Jack Yu investigation. All three are among the Soho Crime authors carving out a new role for global fiction and cultural exploration, within their suspenseful mysteries. And now, back to Garry, whose photo is above. Garry Disher's police procedurals feature Inspector Hal Challis and his fellow investigator Sergeant Ellen Destry. Set in the Mornington Peninsula of Australia, about an hour and a half from Melbourne, they center in a region that's lush, has plenty of rain (trash that old Australia image you carry), lots of pine trees, a beautiful coastline, and wineries -- but also, said Disher last night, the doubling in size of some of the old towns of the peninsula combined with global economic issues has created social distress -- and this is what he mines as he writes. Admitting with a laugh that he inflates the murder rate in order to make better fiction -- Australia is nominally gun-free, and he says most of its murders are domestic, with either a knife or the handiest blunt object -- Disher sees his task as partly one of teasing the reader into prolonged suspense, over each book and over the series. Writing from eight in the morning to "lunchtime" is his regular routine, and he spends the afternoons converting his longhand to typing (doing a "first edit" at the same time) and/or doing research. Usually working from a plan for each book, he places absolute trust in his instincts. And if the instincts lead him off the plan, he follows. My favorite tidbit: He cites an Irish author as declaring each book, to be written, must have a character, a situation, and a promise. More tomorrow on Cara Black; then Henry Chang; then I'm going to indulge in a long piece on James Benn, who held back last night in order to be a great MC, but whose new book, coming in September, features Northern Ireland and his latest insights into a long stretch of significant history. Soho Crime brought out Chang's second Jack Yu book in November, YEAR OF THE DOG, and it's a solid sequel to his debut New York City-based police procedural, CHINATOWN BEAT. It opens with a short description of the characteristics of the Dog as sign for the 11th year in the 12-year repeating Chinese cycle: likeable, fearless, charismatic, the Dog endows the year with masculine characteristics of struggle, perseverance, and faith. And there's no question that Jack Yu needs all of those, as he starts the holiday season in the Ninth Precinct, new to him, where his Chinese-ness is less part of the fabric of each day's work. At least, that was the idea. Back in the 0-5 (in CHINATOWN BEAT) he'd seen his ethnicity be both blessing and curse, as it labeled him and set him up for discriminatory treatment, while also equipping him to understand the Chinatown networks and criminal paths more readily. Probably the toughest part was the unending conflict with his friends from childhood, Tat Louie and Wing Lee. The three youths had been so close that they considered themselves blood brothers, hingdaai. (Chang uses italics for Chinese terms most of the time; he also uses them for inner thoughts of whichever character is at center stage, as well as occasionally for emphasis or for "word as word." Yes, it's a bit confusing. But bear with it -- the tale is worth reading.) Tat Louie heads up a criminal association, and his connection with Jack keeps biting the cop. In YEAR OF THE DOG that connection finally resolves. But first the darkness and cold permeate every aspect of Jack's life, from his dead father to his strong but confused ladyfriend Alexandra to the drum roll of death and destruction beating on him. Chang crafts a classic noir thriller as he imbues the holidays -- Christmas, American New Year, Chinese New Year -- with desolation, threat, and desperation. No question, the gang life and the housing projects where it thrives foster this set of horrors. Quality of life is subzero, even when there's plenty of cash on hand from robberies and extortion. Behind the scenes is the poison of the snakeheads, too -- the criminal corporations that bring illegal immigrants to the land of plenty, then hold them captive for a lifetime through a global reach to family members trapped in China. Chang's intense plotting is complicated by a need to provide a map to the complexity that Jack takes for granted: Chinese of various geographical and linguistic roots, who've arrived in separate waves in New York (as they have also on the West Coast; Jack and the criminals around him are still dealing with a West Coast portion of the earlier book). And in this Asian version of the Sopranos, family connections come before all else. Until they snap and backfire, of course. Jack's first holiday deaths come from a Taiwanese family that appears to have died in a murder-suicide. In parallel, Tat Louie and his gang are suffering a string of robberies that appear to be inside jobs -- a quick way for the gang to lose face, with losses outside its control. New York is a huge city, but the Chinese populations in it are so interwoven that it's just a matter of time before Lucky Louie's problems become Jack's also. Jack didn't know if it was because of the side effects from the painkillers, but he felt sickened. He knew that this horror went on every day in this city, in America, in the world. ... Jack took a breath, closed the report. In his head he was hearing grievous groaning and sobbing, the banshee wail welling up around the sad street of funeral parlors across from the playgrounds of his youth. An underground life full of careless sins, chasing the dragon of good fortune. The dragon was devouring him from inside now. All part of the same evil. He was part of the trail of dirty money that travels in a circle. By the time the firecrackers and street dancing of the Chinese New Year arrive, to mark the turn of year from Dog to Pig, Jack Yu will know a lot more about what has threatened him and the families around him. Chang offers a twist of hope at the end of the volume -- but if you've been reading carefully, you know that Jack Yu's life has just set him up for further danger and risk. Developing a series and at the same time opening up the complexities of Asian life in New York City has taken Chang onto challenging ground. I look forward to more from this writer, and to further exploration of how he braids the danger, despair, and courage that make up policing in any congested urban area -- New York to San Francisco. The St. Johnsbury Athenaeum asked us to pass along word that its first poetry event of the season, a planned reading by Robert Bly on May 29, has been canceled due to Mr. Bly's health. We wish him a sure and speedy recovery. Mark your calendar for July 1, though, when Bly's lifelong friend Donald Hall will read in St. Johnsbury. Details later. It had to happen eventually: Although Shan Tao Yun, mostly referred to as Shan or Inspector Shan, is Han Chinese, his loyalty in Eliot Pattison's award-winning sequence is with the Buddhist Tibetans surviving under Chinese occupation of their land and holy places. Starting with THE SKULL MANTRA (winner of an Edgar award) and continuing through WATER TOUCHING STONE, BONE MOUNTAIN, BEAUTIFUL GHOSTS, and PRAYER OF THE DRAGON, Pattison evokes the beauty and integrity of the tradition of lamas and holy men (and occasional women) of this often harsh land. Shan, in turn exiled as a criminal by the occupying force and then taken into sanctuary by his friends among the Tibetans, has deepened steadily in both his religious practices and his complex relationships. Like a concentration camp survivor, he bears a tattoo of his prisoner number. But if he can convince people to give him a chance, he soon proves his "criminal" past is in fact the best proof of his distance from the Chinese. So in this sixth investigation, Shan at last arrives at Mount Chomolungma, the mother goddess mountain that Westerners know as Mount Everest. Selected as a corpse carrier by the local astrologer, Ama Apte, he doesn't understand why she has chosen him to retrieve the local dead from the mountain where so many Western bodies also linger. To the Chinese who watch him, he's descended into an untouchable caste by doing this. To the Tibetans, he is courting spiritual danger. And underneath all his actions is a compulsion he can't turn from: the desperate desire to rescue his son, who has been imprisoned and is in overwhelming danger at the hands of the Chinese. Why has Ama Apte chosen Shan for the tasks of death that keep following him? Is it simply that, as she tells him, she saw something in his eyes - "You are one of those the dead speak through. The threads of your life become entwined with the dead you touch." And what is forcing the Western mountain climbers to attack the local holy places, and to lose lives in this, as well as in the climb? Entering the base camp below the North Col of Everest was like entering a war zone. Stacks of materiel for doing battle with the mountain lay under tarps fastened with rocks and ropes, each labeled with a trekking company name. Clusters of tents were scattered across the rocky landscape -- some elaborate, brightly colored nylon structures, others, from less well endowed expeditions, affairs of tattered canvas. Porters -- the ammunition carriers of the annual spring war -- scurried about under heavy loads, weaving in and out of small groups of climbers. The foreigners could instantly be identified as new recruits or veterans. The haggard veterans, back from the oxygen-starved, frigid upper slopes, looked as if they had come from weeks of artillery barrage. ... Two weeks earlier, Shan had seen a man writhing in agony on a stretcher, half his face dead from frostbite. He sat long ..., watching the fire dwindle to ashes, driving the world from his mind the way Gendun and Lokesh had taught him. Finally he went to the lip of the high ledge and folded his hands into the diamond of the mind mudra for focus, looking over the sleeping town and the snowcapped sentinels on the horizon. After an hour he found a quiet place within. After another hour he began to let each piece of evidence enter the place, turning it, twisting it, prodding it, looking for and finally finding the one little ember that was smoldering under it all. Pattison's language is elegant and vivid, and the relationships that he probes among the land's past and present residents, human and of spirit, are integral to Shan's investigations. Only a sound comprehension of the way his adopted compatriots think and worship can bring Shan to valid answers. Courage and stamina must root themselves in the skills of listening and paying attention -- the root skills of all investigators and all seekers for wisdom. The Old Stone House Museum in Brownington is sponsoring a Robert Frost Poetry Reading on the shore of Willoughby Lake in Westmore, VT, on Sunday afternoon, May 31, from 2 to 4 p.m. Frost and his family camped on the same spot 100 years ago this summer. Several area poets are going to read, including Galway Kinnell, Leland Kinsey, David Budbill, Lindsay Knowlton, Jerry Johnson, and Burt Porter, who has put a couple of poems to music. Local students who have just read Natalie Bober's A Restless Spirit, the biography of Robert Frost will be exhibiting their Frost-inspired projects, and the Willoughvale Inn will be providing refreshments. The site is just below the Willoughvale Inn on Rt. 5A (Westmore, VT). Parking is in the Willoughvale parking lot. Follow the path down to the lake. The event is sponsored by the Old Stone House Museum. This Sunday, May 24th, at 7:30 p.m., the former Poet Laureate of the United States and Pulitzer Prize-winner Maxine Kumin and award-winning poet Sydney Lea will read from their work at the Shelburne-Buckland Community Center, 53 Main Street, Shelburne Falls, MA. This extraordinary event is sponsored by the Collected Poets Series and Mocha Maya's. Suggested donation $5.00. Maxine's 16th poetry collection, Still To Mow, published by W. W. Norton in 2007, has just come out in paperback. Norton has also published Jack and Other New Poems and earlier collections, including Selected Poems 1960-1990. Maxine is the author of a memoir about a nearly fatal carriage-driving accident, Inside the Halo and Beyond: Anatomy of a Recovery, and Always Beginning: Essays on a Life in Poetry. Her awards include the Pulitzer and Ruth Lilly Poetry Prizes, the Poet’s Prize, the Aiken Taylor Award, the 2005 Harvard Arts Medal, the Robert Frost Medal in 2006, the 2008 Paterson Prize and the 2009 Paterson award for distinguished achievement. In 1981-2, Maxine Kumin served as Poet Laureate of the United States. She and her husband live on a horse farm in Warner, New Hampshire. Author of eight collections of poetry, most recently Ghost Pain (Sarabande, 2005); Sydney's prior volume, Pursuit of a Wound (U. of Illinois, 2000) was a Pulitzer finalist, and the one before that, To the Bone, shared the 1998 Poets' Prize. Recipient of fellowships from the Guggenheim, Rockefeller and Fulbright Foundations, he has also published two books of naturalist nonfiction and a novel. Sydney was founder and editor of New England Review. He has taught at Yale, Wesleyan, Middlebury, Dartmouth, and at several European institutions. His work across four genres has appeared in sixty anthologies, and his periodical credits include the major national quarterlies, The New Yorker, The Atlantic, The New Republic, the New York Times, Sports Illustrated and many others. Sydney has been involved in several large conservation projects, including a 360,000 acre project in Maine and an effort to restore freshwater fish habitat in Vermont. He is also longtime vice-president of Central Vermont Adult Basic Education, a forty-year-old literacy and essential skills endeavor. He lives in northern Vermont with his wife, lawyer and mediator Robin Barone. They have five grown children. He currently teaches in at Dartmouth. For more information see www.collectedpoets.com or www.mochamayas.com or call 413-625-6702. 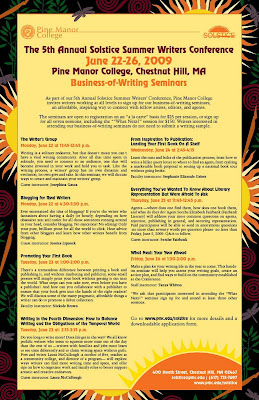 Pine Manor College is pleased to announce the introduction of a business-of-writing seminar series, offered as part of the 5th Annual Solstice Summer Writers’ Conference, scheduled from June 22–26 in Chestnut Hill, MA. Pine Manor College invites writers working at all levels to sign up for our business-of-writing seminars, an affordable, inspiring way to connect with fellow artists, editors, and agents. The seminars are open to registration on an “a la carte” basis for $25 per session; or sign up for all seven sessions, including the *”What Next?” session for $150. Writers interested in attending our business-of-writing seminars do not need to submit a writing sample; seminars are free to attendees of the Solstice Summer Writers Conference, but open to all interested writers. For detailed bios of our faculty and downloadable application forms, go to: http://www.pmc.edu/solstice. 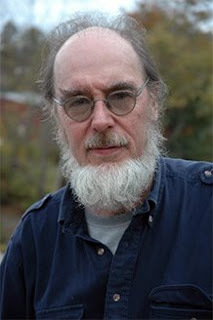 New Hampshire Poet Dudley Laufman Wins National Recognition -- For His Other Form of Meter! Washington, D.C. – Dudley Laufman, a musician and barn dance caller from Canterbury, N.H., has been awarded the nation’s highest honor in the folk and traditional arts, the National Heritage Fellowship. The National Endowment for the Arts, which bestows the fellowships, announced this year’s 11 winners today. Laufman is the third New Hampshire resident to receive the award. Contra dance musician and composer Bob McQuillen of Peterborough earned a National Heritage Fellowship in 2002, and Littleton basketmaker Newt Washburn was selected in 1987. “I really didn’t believe it at first,” Laufman says of the honor, which comes with a $25,000 honorarium and will be celebrated with ceremonies and performances in Washington, D.C., September 21-24, with the public performance on Thursday, September 24. At 78, Laufman has been involved in the contra dance and barn dance community in New Hampshire for over 60 years. He called his first dance in 1948 and soon started his own musical group for the dances, which later became the Canterbury Country Dance Orchestra. During the 1970s, the orchestra made a number of recordings, and Laufman traveled throughout the region, performing and teaching dance, averaging 300 or more engagements each year. As longtime members of the New Hampshire State Council on the Arts’ Traditional Arts and Folklife Listing, Laufman and his partner Jacqueline Laufman – the two perform together in the group Two Fiddles -- are sought after to conduct barn dance residencies in schools and at community centers. Laufman has been the subject of a documentary film, The Other Way Back: Dancing with Dudley, and he and Jacqueline recently published “Traditional Barn Dances with Calls & Fiddling,” an instruction book that includes two music CDs and a DVD, through Human Kinetics press. The other winners of the 2009 NEA National Heritage Fellowships are: the Birmingham Sunlights, an a cappella gospel group from Birmingham, Ala.; Chitresh Das, a Kathak dancer and choreographer from San Francisco; LeRoy Graber, a German-Russian willow basketmaker from Freeman, S.D. ; “Queen” Ida Guillory, a zydeco musician from Dale City, Calif.; Amma D. McKen, a Yoruba Orisha singer from Brooklyn, N.Y.; Joel Nelso, a cowboy poet from Alpine, Texas; Teri Rofkar, a Tlingit weaver and basketmaker from Sitka, Alaska; Sophiline Cheam, a Cambodian classical dancer and choreographer from Long Beach, Calif.; Edwin Colón, a cuatro player from Orocovis, Puerto Rico; and Mike Seeger, a musician, cultural scholar, and advocate from Lexington, Va., who won the Bess Lomax Hawes Award for his significant contribution to the preservation and awareness of cultural heritage. KINGDOM BOOKS offers some of Laufman's books of poetry: browse them here. Calendar Alert, May 6: Poet April Bernard and Jane Austen??! In her final superb novel, Persuasion, Jane Austen combined social satire with profound feeling. Why does this “fairy tale for grown-ups” continue to compel readers? How does Austen hold our attention and sympathy? And finally, who are some contemporary writers who might have learned some of Austen’s lessons? Carol Ann Duffy grew up in a working-class neighborhood in Glasgow, Scotland. At 53, she's a poet of power and controversy -- and she is Britain's new Poet Laureate, the first woman to hold the position in its 341 years. She says she wants to be known as a poet and a mother, although many a commentator has been wide-eyed in saying she is also openly a lesbian. The New York Times announced her appointment on Saturday, saying she is "known for using a deceptively simple style to produce accessible, often mischievous poems and dealing with the darkest turmoil and the lightest minutiae of everyday life." Her web sit is spartan -- www.carolannduffy.co.uk -- and quickly refers readers to another site, www.sheerpoetry.co.uk, which requires a subscription fee of 12 pounds in order to access the poetry and discussion of classroom opportunities. One of Duffy's poems was recently pulled out of British school curriculum because of knife violence in it (see the Guardian story). I did find a site that offers four of her poems, although you've got to ignore a lot of advertising to open it (famouspoetsandpoem.com). There are four poems on it at present -- the one called "Stuffed" is a shocker, and "Valentine" is a delicious love poem that offers the heart as an onion: "Its scent will cling to your fingers, /cling to your knife." Stay tuned for more hot discussion of Duffy's poems and her new position. This is going to be far from the "stiff upper lip" notion of British public faces. I'm delighted.